That was the feeling even before Mercedes' drivers began to talk to the media, and when they did, they backed it up. F1 testing 2019: Which is the best-looking car? "Ferrari are very, very strong right now, as you have seen," Lewis Hamilton said. "They are racking up great mileage as well. It appears that they have a better package than they had last year, which means it is going to be even more of a challenge for us." "No matter which kind of fuel load or engine modes they're running," his team-mate Valtteri Bottas said, "whatever you try to correct for, in any case they are quick. Both short runs and long runs. So I think we feel at this point they're going to be a bit ahead. "In terms of car behaviour, we still have work to do getting the balance together. With the new rules, it's going to be a big development race. We don't think anyone is going with this type of car in this test to the first race, including us. "We do have new parts coming for the first race. [But] we can't really rely on that being an upgrade. We do need, even with this spec of car, to try to make it better and quicker. In the context of Mercedes' five consecutive drivers' and constructors' championship doubles, these claims are going to be taken by many with at least a pinch of salt. 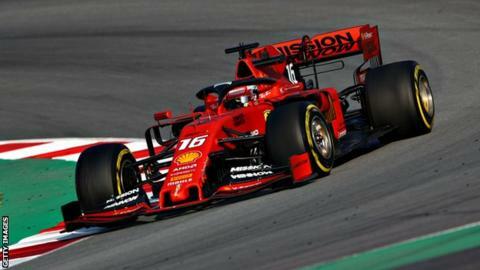 Speaking on the final day of the test, Ferrari's Charles Leclerc was keen to downplay the significance of the results so far. "The performance has no sense for now because it remains testing," said the team's new recruit, who was immediately at home and very quick in the red car. "They are probably not pushing and we are not either. We don't know how much the others are sandbagging so we'll see at the first race." That translates as: I'll believe Mercedes are lagging behind when I see it - for now, let's assume they are not showing their true pace. Or 'sandbagging', as F1 lexicon has it. Even with their improvement on the final day, the evidence suggests Mercedes would not be the team to beat if the first race of the season was tomorrow. It is always difficult to accurately assess where teams stand after just four days of winter running - there are too many variables. Nevertheless, as the first test at the Circuit de Barcelona-Catalunya progressed, an impression formed. What follows is based on assessing timing data, and information from senior figures across the sport. It's important to say at this point that even the teams, who have vastly more data and ability to analyse it than outsiders, don't know for sure. As one senior figure put it: "You're trying to glean too much information from too little data. And it's the same for us." But that does not mean you have to throw your arms in the air, give up and just wait to see how the cards fall in qualifying in Melbourne next month. After all, where's the fun in that? There are things that can be done to clear away some of the confusion, and discern some shapes in the fog. The list of headline fastest lap times set by each team is as good as meaningless. It is topped by Renault, followed by Toro Rosso and Alfa Romeo (the former Sauber team). Mercedes and Ferrari are fourth and fifth, and Red Bull only eighth. The problem with the headline times is that the drivers are using different tyres, and the list takes no account of the amount of fuel on board. However, it is possible to make a best effort to correct for those two things. Teams never reveal their fuel loads but one can assess factors such as the length of the run on which times were set, and therefore work out the minimum amount of fuel each driver must have had on board and correct for it. It's not an absolute gauge, but it gets closer to reality. You can also add in the performance difference of the tyre used, and calculate the time back to a baseline for a single compound. This is not an exact science either - not everyone agrees on what the off-sets are between each of the tyres. In Spain this week, Pirelli's own estimate for the gap between two of the five types of tyre was three times larger than that of one of the teams. But one can take Pirelli's own estimates, add a few opinions from varying teams, look at the evidence of each drivers' times, create a ballpark figure, and apply it across the board. From there, one can calculate a figure for the best fuel and tyre-corrected time by each team. Many variables remain - including how hard the team were using the engine - but this method usually gets a result that is not too far away from reality. A gap of perhaps 0.3secs to Mercedes and Red Bull, with differing views on who might be ahead, although it seems that Mercedes may well be a smidge in front. it's about 0.7secs back to Renault who are perhaps 0.2secs or so ahead of Alfa Romeo and Haas, the two Ferrari customer teams, with Toro Rosso, McLaren and Racing Point very close behind them, and very difficult to choose between. There is then a sizeable gap to Williams, but how much is impossible to know, owing to their lack of running following the late arrival of their car. Don't think of the list as completely accurate. See it as a guide, something to point in vaguely the right direction. The only proviso to it is that British rookie Lando Norris did one lap on the second-hardest tyre compound on the second day of the test that would have moved McLaren up to just behind Renault but then neither he nor team-mate Carlos Sainz got near it again, and the team are playing down expectations. It's perhaps best for now to treat it as an anomaly. Why might Mercedes be struggling? If the Ferrari is a step ahead of everyone else - as senior insiders agree it is - it's not necessarily a surprise. While Hamilton won the title last year, Vettel could - and arguably should - have done had he and Ferrari not made so many mistakes. Between them, they tossed away at least as many points as the difference between the two men in the championship at the end of the season. In both seasons since rule changes ahead of 2017 introduced wider, faster cars, Ferrari have started the year with a better car than Mercedes, only to implode later in the season. This year, there have been further regulation changes, most importantly a revision to the front wing, making it wider and simpler. The aim was to reduce aerodynamic turbulence for the car behind and make overtaking easier. The wing has changed the way the cars' aerodynamics work. When rules change, some teams get it more right than others and the Ferrari has a noticeably different front wing design from Mercedes. The Ferrari's is quite radical. The various fins above the main - or bottom - plane all start high in the centre of the car and slope down towards the outside. Mercedes, meanwhile, have a more conventional-looking wing for now - as do Red Bull. This may or may not be part of the reason why the two cars appear to be performing differently - the two teams have pursued opposing aerodynamic philosophies in other ways over the last two years yet the overall performance of their cars has been very similar. But, for now, whatever the reason, the Ferrari looks faster, able to access that speed more easily, and more comfortable with it. While Bottas was talking about the handling balance of the Mercedes still needing work, sources say that, inside Ferrari, Vettel and Leclerc have been saying they find the car easy to drive, and the limit comfortable to access. All of this amounts to a guesstimated snapshot, with little information, at the very earliest point of the season. And given the quality of Mercedes as a team, and the way they and Hamilton have dug deep to win both of the last two titles, few would consider them as anything other than serious title contenders. As Hamilton put it: "We are the only team to have won a championship in a crossover of rules situation and even if we don't start on the right foot at the first race I feel confident." Be that as it may, the early signs are that the world champions have some catching up to do. Renault appear to have made a step towards the big teams, albeit remaining some distance away, and moved a little clear of the rest. Behind them, the midfield looks to have become even closer than it already was. Renault and Alfa Romeo impressed in the first test - Renault for some very strong long runs, which put them not that far off the pace of Mercedes; and Alfa Romeo, the former Sauber team now very closely affiliated to Ferrari, for consistent pace. But Haas also showed speed, Racing Point made it plain they have a lot of developments to come to what they say is a very basic launch car, McLaren have had their most reliable first test for five years and Toro Rosso set some eye-catching times, rookie Alexander Albon ending up with second fastest lap all week. As for Williams, it was a difficult test, the car not appearing on track until the third afternoon, and the team working to understand it as much as possible without looking for lap times for the day and a half they did have. The word is that Williams could be facing a tough season but, just as with the fight at the front, the second test next week will provide further information as to where everyone stands.